One of my girls was diagnosed with celiac disease a couple of years ago, and one of the hardest parts of eating gluten-free is figuring out eating at school and in social situations. We really are so fortunate now, because there are so many GF options in grocery stores, and even restaurants. School has started or is starting soon, and that means school lunches! It can be hard to think of different ideas, and keep kids excited about what’s in their lunch. 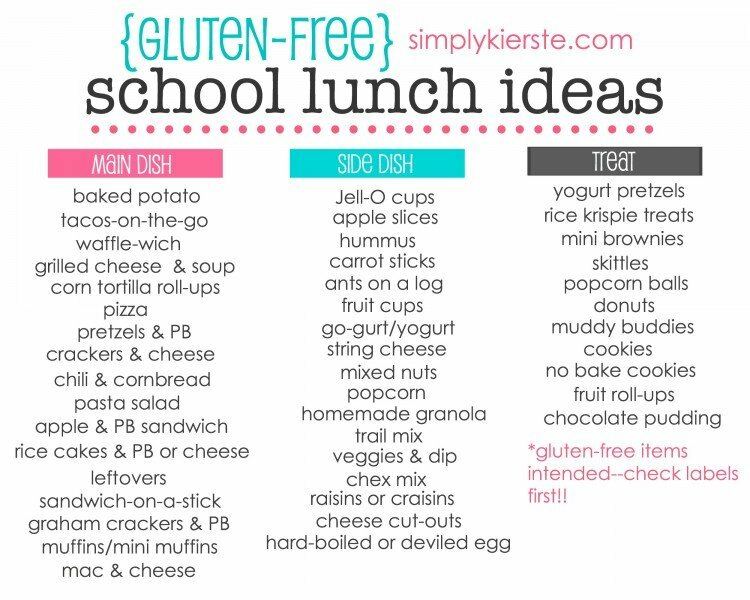 I know there are others of you that are going through the same thing, and I thought I’d share some gluten-free school lunch ideas! I think the key to gluten-free lunches is variety, and switching it up so it doesn’t get boring. Gluten-free products are really expensive, so several days of the week I try to pack things that are naturally gluten-free. It saves on my food budget, for sure! One thing that really broadens the horizons when it comes to lunch options is a thermos. It adds so many options–leftovers, soups, and even a baked potato! Be sure to keep things warm with a thermos, or cool with ice packs, for taste and for safety. I also pack a little treat in her lunch every day. It’s easy to feel left out when you can’t have gluten, so I like to make it fun and exciting to open. 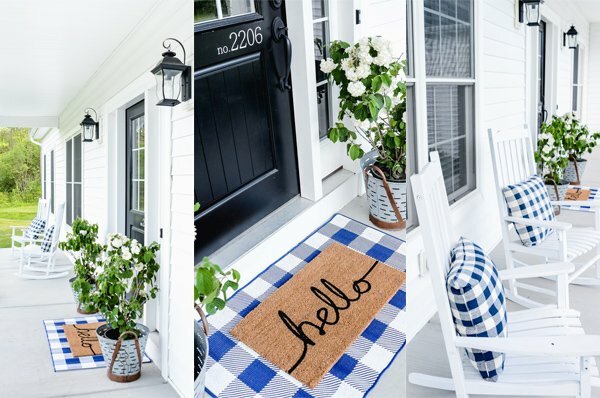 I’ve gathered a few ideas that will take you through a whole month! I have 20 main dishes, lots of side dishes and treat ideas that you an mix and match. As you know, always check labels to make sure that all ingredients are gluten-free! I’ve included our favorite brands, and the ones we use the most often. I tend to use a lot of baking and bread mixes to make as many things as I can–bread, muffins, cookies, cornbread, etc. I think they taste better, and even though it’s expensive, it’s much less expensive than buying them already made. I do buy some convenience foods to have on hand for regular use, and to have just in case I need something quickly. As far as preparation goes, I like to make things ahead and freeze them–cupcakes (unfrosted), muffins, cookies and/or cookie dough–anything that I can do ahead and save myself some time during the week. That includes things like chopping veggies, making a lunch menu plan along with my daughter, and organizing all lunch items. Are there crazy week where not all goes to plan? Or we don’t have a plan? Of course. But I always have simple ideas ready to go for those especially crazy mornings. I made you a list that you can print and hang on your fridge, or put in a binder for reference! It doesn’t have anything labeled “GF”, because I couldn’t fit it on there, but just as a reminder, everything I’m referring to, put “gluten-free” in front of it. :) I also have explanations of each item below, with links to products. 2. Pasta Salad: Schar is our favorite! 3. Apple & Peanut Butter Sandwich: Slice apple slices flat, and layer them with peanut butter! You can soak your apple slices in apple juice or pineapple juice instead of lemon juice, so it doesn’t affect the flavor. 5. Pizza: GF English Muffins, sauce, mozzarella cheese and desired toppings–broiled and toasted in the oven. Or…leftover pizza from the night before! 7. Chili & Gluten Free Cornbread, with Fritos! 10. Wafflewich! : Van’s makes a great GF waffle, or you can use homemade or another favorite brand! It’s yummy with ham and cheese. Or…send it with maple syrup or favorite waffle topping to go. 11. Mac & Cheese: homemade, or Annie’s Gluten Free Mac & Cheese is really good! 13. Muffins–any kind! We love the King Arthur Baking Mix and Pamela’s Ultimate Baking and Pancake Mix. Mini muffins are really fun, and you can serve with with fresh fruit. 15. Baked Potato in a Thermos: bake a potato wrapped in aluminum foil, open it and add the butter, then close it back up. Send along toppings-cheese, bacon bits, green onion, etc. 3. Fruit cups: mandarin oranges, peaches, etc. 8. Homemade Trail Mix: peanuts, raisins, M&Ms, craisins, cashews, whatever you like! 11. Fresh fruit: whatever’s in season! Watermelon, orange slices, strawberries, blueberries, blackberries, apples, cherries, etc. 3. Homemade Cookies: I use a rice flour baking mix that you can use on a 1:1 ratio instead of flour. 4. Sugar Cookies: Our favorite brand is Cherrybrook Kitchen-so yummy!! As always, please check labels to ensure that they are Gluten Free!! Utilize a thermos–they make a world of difference for a gluten-free kiddo! It opens up a lot of options for soups and more! Plan ahead. Make your menu a week ahead, shop on the weekend, and prepare veggies and other items and place in containers in your fridge so you’re ready to put it all together. Involve your child in the planning. They are the ones that will be eating the lunch, and it’s important that they love what’s in there! Have small ice packs or another way to keep food items cold when necessary. Have a back-up, QUICK lunch plan in place. There are some mornings that we are behind, with limited time, and it helps to have some things on hand so you can pack a lunch very quickly! use a FUN lunch box! anything “mini” or on a stick is always popular. Use toothpicks–they’re kid-size! great lists, just pinned! My husband has had a recent gluten intolerance, so this is great for him, too! How do you keep the grilled cheese or pizza english muffin warm? Or do their teachers re-heat? Sorry, I am sure that’s a silly question, just wasn’t sure if you put it in a thermos or something else that’s insulated:-) Thanks!! This list and links help so much! Hi, June! Yep–that’s what I wrote in my post (I go through each item below the list), homemade chex mix. :) It’s a favorite at our house!